Keep your cosmetics organized with our portable, high quality makeup cases. Our stylish trolleys are made with heavy-duty aluminum frames & lined on the inside with premium, fashionable materials. Our range of multi compartments products are great beauty organisers and feature in small, medium and large styles to suit your taste and collection. Our variety of products come in several colours, silver, black and hot pink. If a trolley on wheels is not your style, our range of deluxe travel bags will also make transporting your cosmetics simple and easy. On top of our easy to move products, our range of organisers & stands are perfect to sit on top of your draws or beauty table to keep your collection in order at home. 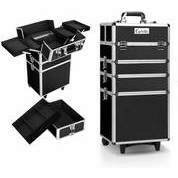 Get the professional look with our cosmetic organisers. Our affordable products are perfect for people who are just learning their craft at TAFE or running their own beauty salon. Our products are also perfect for hairstylists, therapists or personal use. With some of our products coming with lock & keys, you’ll be able to keep your cosmetics safe & secure while left unattended or perfect to keep the younger sister out of your collection. Start organising your collection today & be one step closer to having the professional look. With the help of Mydeal, selecting and purchasing one of these beauty product transporters online has never been easier. A great idea for birthday present for young beauty fanatic, get one today.